How would you like the virtual equivalent of foot-traffic? You know, that thing many brick-and-mortar businesses, especially those located in malls, rely on? Saturday morning crowds with bulging wallets and itchy pin-numbers eager to spend their cash, the gleam of consumerism glistening on their well-fed faces as they stampede towards the cash register. With our new web forms we give you the digital equivalent, but we go one better as well, by making sure you get leads that not only want to spend money, but have confirmed that they want to spend it on your product or service. If we weren't such nice people, we'd consider asking for commission. 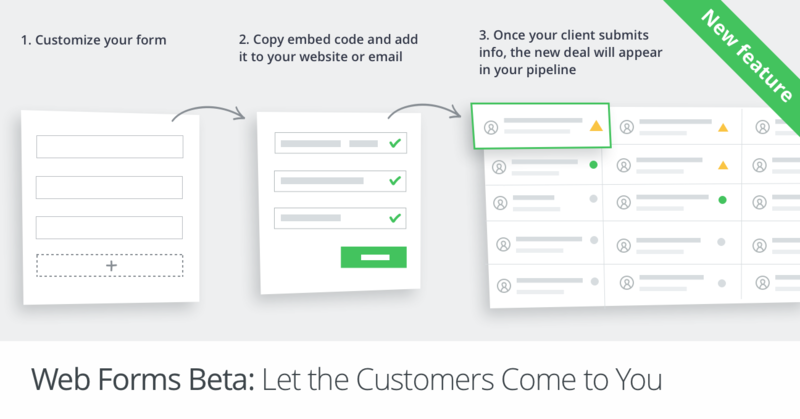 Our new web forms beta gives you multiple options to generate quality leads. The code is simple and requires just a few clicks to use, meaning you don't need any technical skill to embed these forms all over the place. On top of that, we've made the forms fully customizable, so that you gather the information that's relevant to your business and sales team without wasting your potential customer's time. Get potential clients' names, email addresses, phone numbers, shoe size, star sign or hair color (you may not want all of those) delivered straight into your pipeline. The first and most obvious way to use a web form is to place it on an easy-to-find page on your website. This allows potential customers to leave you their contact details, which are then automatically ingested into Pipedrive according to your settings, meaning your pipeline is up-to-date with quality, hand-raising leads. If you have a decent newsletter or email database, you can also place a link to the form in an email and send it out. Again, the information supplied will automatically be imported into your Pipedrive. And just like that, you're generating leads and managing them inside your pipeline with minimal effort on your part. Maybe you want to upsell existing customers, or awaken clients whose accounts have gone dormant? Maybe you sell different services to different target markets? That's no problem as our customization options allow you to use multiple forms, targeted at different groups, and configured according to your wishes. From now on, you won't miss making contact with a single interested customer because someone lost a business card or a phone number. The details will all automatically be in Pipedrive. 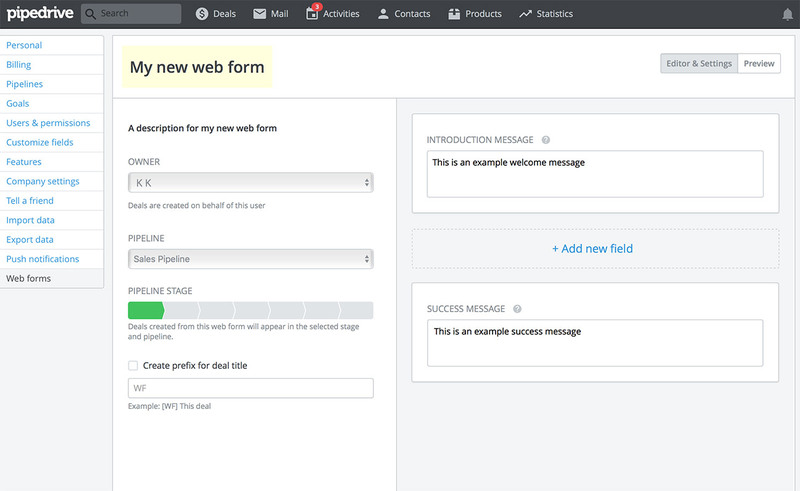 In fact, you can even set up a form specifically for your sales team as a lead-capturing tool. This means you and your team won't spend hours chasing dead leads or cold-calling customers with no interest in your product. Ready to get started? Simply go to the settings menu, find web forms and follow the simple instructions from there. Note that you need to be an admin user, or befriend one, to set web forms up. 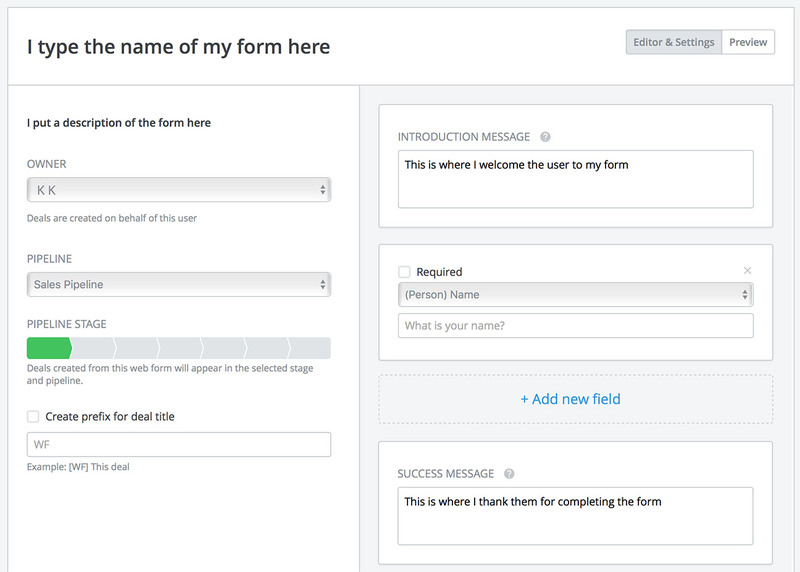 These forms are built to simplify data collection and give users ease of use. Remember, this is the beta version, so as always we place huge value on your feedback to help us iron out glitches and improve where possible. And should you require more complex forms or information gathering, we offer full integration with the likes of Wufoo and MailChimp through Zapier.